Google My Business is a free service that Google provides where local businesses can list details about their business. The search engine prepares a knowledge panel from the details you give and from other information about your business on the web. If you run a local business, then having a Google My Business listing is a must for Local SEO. It helps you stand a better chance of appearing in search results such as the local map listings. It helps you give potential customers information if they search for your business name. The panel in the search results contains things like business address, opening hours and contact details. Google My Business listing also offers you the chance to do much more than list your basic details. Google My Business features are regularly rolled out to make your business listing even more useful. I do not recommend you create local GMB page if you are an online-only business. In fact, it can hurt your traffic and is against GMB guidelines. Do you have a physical location that customers can visit? It might be a small home studio. Do you visit your customers at their location? This could be, for example, a service business. Do the search queries from to your website typically include a suburb or city name? If you answered yes to one of the questions above, then it probably will be worth claiming a local GMB listing. Remember it is telling Google that you do most of your business in that particular area. For example, an online florist who delivers locally and also has a home studio where brides can meet for a consultation will want a GMB listing. But an Auckland-based online quilt store that operates out of a home studio, delivers Nationwide and does not want customers visiting will not want a GMB listing. And having one could, in fact, decrease the rankings for searches from locations further away eg Wellington. If most of your customers do not live in your city, then the local listing could end up costing you search traffic. 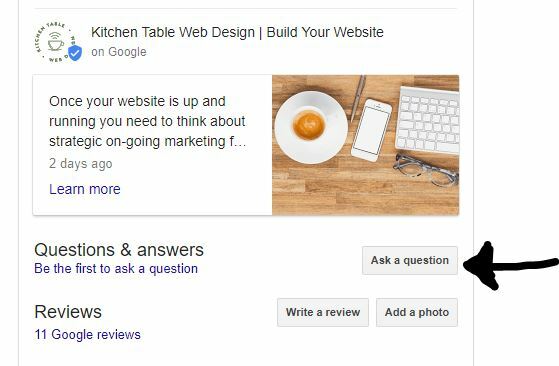 The Google My Business Q&A section gives your customers the chance to ask questions which anyone can answer. These can be anything from a specific question about a product, or information about opening hours. To make the most of this, you should monitor your listing regularly. Make sure you answer these questions before anyone else does. This way you make sure that the answers are correct and offer the information you want. Google users can vote these questions up which will help determine which ones show highest within the section. As a business owner, you may want to consider asking some family or friends or trusted customers to ask some questions. Then you can answer them to get this section off to a good start. You can even ask and then answer your own questions. Google reinstated the business description feature. The description shows up when a customer uses a mobile device to search for something and clicks on your business in the Google Maps results. While you should not stuff your business description with keywords, it is important to write it carefully to include the right information. Describe what makes your business stand out from the rest and what services or products you provide. The description can change only by a maximum of 750 characters so you might need to complete a couple of drafts to make sure you include everything within word limits. Although Google My Business Posts have been around for a while, not all businesses take advantage of them. Posts allow you to share snippets of information with your customers and potential customers. They appear just under your business details and include a photo. You can also use them as a link back to your website or to give information about an event. If you are running a special offer or limited discount you can also add this information in a post along with the coupon code or link for details. Posts are live for seven days after which they expire. However, you can post as often as you like. And of course, you shouldn’t forget the importance of Google reviews too. These reviews from your customers are displayed on your listing and can encourage new customers to decide to use your business. Taking the time to add a Google My Business Posts each week could be an effective use of your marketing budget. It is a little like micro-blogging on your GMB Listing. Google posts help your Google My Business Listing standout and can improve your conversion rates for Local SEO. They also give a mild boost to your overall ranking. They show in local search and on maps. There are no restrictions on words in the images in the posts like there are on Facebook advertising, so you could use that space to highlight your business offering with a call now image. Should you use Google My Business posts? I imagine the numbers are similar to New Zealand. Here are 3 reasons to give Google My Business posts a try. Firstly, you the post will stand out from the crowd because so few businesses are adding posts. Secondly, the cost of the effort is small. It certainly worth trialling for a couple of months. And thirdly, with the changes in the Facebook algorithm for Facebook Pages, you might find it better to switch some of your efforts to Google My Business. At Kitchen Table Web Design we offer a weekly GMB post for $50 a month. They are also included in our Basic SEO plans. You can not at the present time, schedule posts ahead of time through Buffer or a similar social media poster. However, it is more time efficient to prepare a few posts at once and store them in a folder on your PC. GMB posts are shown for 1 week only. Therefore, you can recycle any of your posts, especially those that have a high engagement. By recycling, I mean add the same image and text to make a new post. Step 1: Prepare your images. The ideal Google My Business Post image size is a minimum size of 720 pixels wide and 540 pixels tall or larger in that ratio. (At the time of publishing this article but you may have to experiment as Google does change the image size every now and again. The image will be resized to appear on the knowledge panel. For example on a desktop, the image shows as 187px by 140 px so bear that in mind when selecting font size if you are incorporating words on your image. Step 2: Write some call to action sentences. Or write something that will pique someone’s interest in your core services or products. You need something around 100 to 300 words for each post. Step 3: Publish a post each week. Go to your Google My Business dashboard and click on “Posts”. Upload your image, add your text and select a link option. Add a UTM parameter if you want to track the clicks. UTM parameters are tags you add to a URL — the tags are sent back to Google Analytics and tracked. Read Rafflecopter | UTM Best Practices for more details about how to create them. 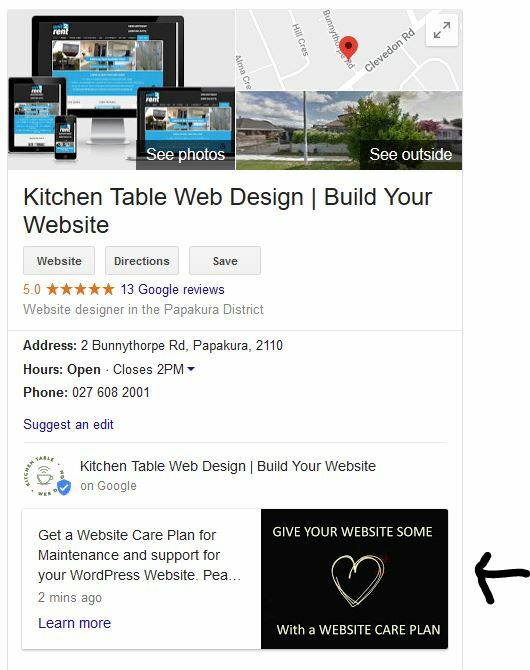 An example is https://www.buildyourwebsite.co.nz/website-care-plans/?utm_source=gmb. I can tell if the person came from GMB post or from another source ie the ?utm_source=gmb. Preview your post, check and then click the publish button. It is worth bearing in mind that Google posts are indexed by Google. Mike is suggesting that it might be worth focusing on long tail phrases ie 3-4 word keyword phrases that are very specific to your company rather than something very broad that has high competition. Do be accurate and clear about the offer you are making. Make the content friendly and timely. Don’t use commercial slang and excessive sale pitch. It is best not to include more than one offer. In this article, I have explained why using Google My Business Posts for your Local Business is an effective use of your marketing budget both in time and effort. I have also included some tips to get the most out of your posts and well as some brief instructions showing how to create them. The next step is to start adding posts to your Google My Business Page. If you would like to delegate this, Kitchen Table Web Design offers a weekly GMB post service. Weekly GMB posts are also included in our Basic SEO plans. 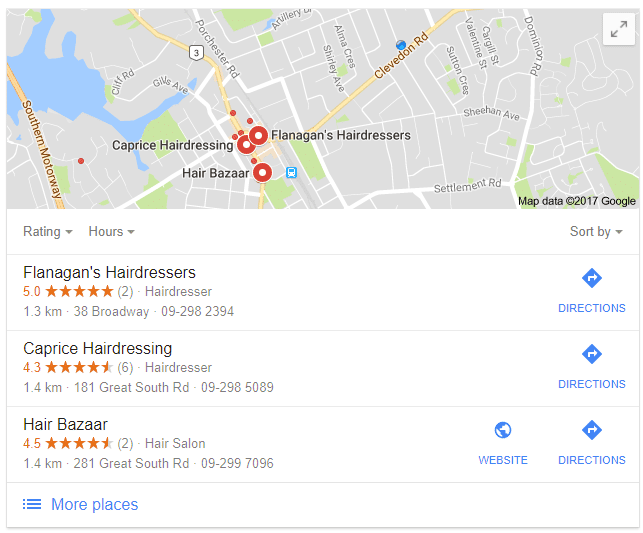 Google uses the reviews and ratings on your Google My Business Listing (as well as other factors) to decide the value of your small business website to their customers, i.e. the people using Google Search. These reviews are especially important for “local search” results. A local search is a search where Google determines that a person is searching for businesses near their location. The search does not need to contain a location. For example, I searched for “hairdresser”. At the top of the search results, are local hairdressers. See below. I did not need to search “hairdresser” and my location. Google determined by my search “hairdresser” I was looking for a local business. If I search “Advice hairdressers” I am not given local results. The results included top salons around the world. Google reviews need to be genuine. How well are you doing with your GMB Page? Record your score and then take some steps to improve it over the coming months. We offer Google My Business Services so you can take advantage of the GMB listing and reach more customers. We claim or create your business listing, work with you if required to remove any duplicates or errors. Optimise your settings on Google My Business including adding hours, address, phone number, photos, business details. There is some indication that weekly Google My Business posts help you rank. This service includes a weekly Post with photo and call to action as well as working with you to improve your GMB page. These services included in our SEO Plans for business where local search is important.